Portishead in Montreal or Quebec City? Inform me about the next events for Portishead. Enroll yourself to our priority waiting list for Portishead to be alerted when new tickets are available. Filling this form doesn't engage you to any purchase. Portishead is coming back to Montreal at last! Don't miss Bristol, UK's phenomenal trip hop act as they perform at Jacques-Cartier Pier, in Old Montreal, on Octobre 7th, 2011. The last time Portishead fans got to see them live in Montreal was way back in 1997... before the band split up for 11 years! 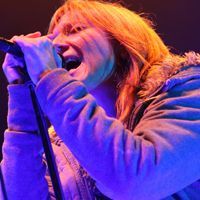 In 2008, Portishead reappeared with the critically acclaimed Third, often cited amongst the best albums of 2008.